What are snakes like with travelling under doors etc? I'd personally freak out if I saw a snake in the house, but we have a dog that sleeps in the laundry, so we leave the door open a little bit so he can go outside. We've had rats make themselves at home under the washing machine a few months ago. Also, I have birds out the front in a smallish elevated cage, the gaps between the bars are about 1cm. Are there snakes small enough to fit through that, that would be a threat to them? Since summer is coming up and the aircons running during the night, one of my worries is a snake making it's way into the bird cage. 1cm is more than adequate for snakes to get under, depending on size obviously. I have caught countless snakes (usually Brown Tree Snakes) from small bird cages, its the old story they get in, eat the bird(s) then can't get out. It rained at long last. Darling son found this little cutey when he was checking the gutters. He was in the down pipe. Poor baby was frozen from being in the cold water. He has been released over at the dam as the house yard isn't safe for him because of the dogs. Why do I see us having to catch him again and move him when he finds out the hen is going to have fluffy little chickens soon? Well I woke up this morning and was having a cuppa coffee and chatting to my dad when I looked out the window to see a 5-6ft Eastern Brown Snake staring back at me from our front garden. called South Side Snake Services to come and relocate it so we wouldn't have any dramas with the dogs or us getting bitten. Lately I have seen three snakes. Two on a farm near Rockhampton and one in Brisbane. On the farm I saw a nice brown tree snake and a brown (or taipan?). In Brisbane last weekend I saw a common tree snake. Been sightings of snakes across Uni Hall during the year, but the last sighting was 12th July 2011. None has been seen around here since then! Nice EB Scottie, glad to see you got it relocated instead of giving it the shovel treatment. Yeh it is well worth the bit of money to get someone out to remove them rather then chopping their head off with a shovel which is quite dangerous for someone to do who doesn't deal with snakes on a regular basis and know what they are doing. Plus the snake gets to live another day. This is the first venomous snake we have seen here at Spring Mountain since we have been here 4 years. If it was just a carpet, brown tree snake or common tree snake we would have just left it alone to carry on. Surprisingly, since we have such a snake friendly place and attitude to them, I haven't seen one of the nasties this year or last year. Not even a red belly. Lots of tree snakes and pythons though. I wonder if our attitude of not caring about sharing the place with them has anything to do with it. EG, our pythons and other non nasties keep the food load down so there is nothing to attract and keep the nasties here? Any ideas on that thought? What a Beauty! Great footage, Thanks for sharing. Edit Reason: Last time I saw a snake (green tree snake) was about 2 mths ago now... probably because I am not getting outdoors enough.. I think it was out hunting frogs when I saw it. The other snake I saw I am pretty sure was a nasty one and I would guess it was around 1.5 m long. My guess would be an eastern brown, king brown or coastal taipan. It was quick what ever it was and I certainly wasn't interested in getting a closer look! PS. Please correct me if I have identified the snake incorrectly (though I am pretty confident I have it right). 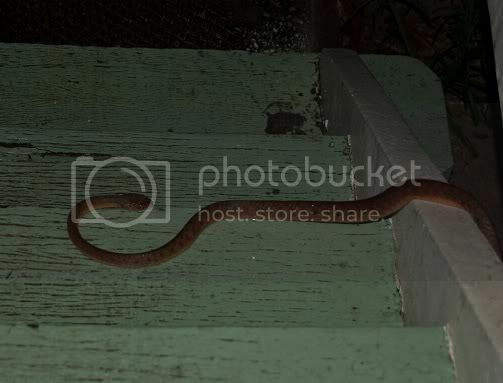 Yep MC Thomas its a Boiga irregularis aka Brown Tree Snake, sometimes also called a Night Tiger or a Dolls eye snake. Rear fanged, very very mildly venomous but not considered dangerous to humans. Thanks for the confirmation. I must admit, I have a fear of snakes, though I think this fear is mostly rational and I am getting better. In the last several years I have gotten a bit too close to a few snakes, mostly small and hopefully harmless ones though. 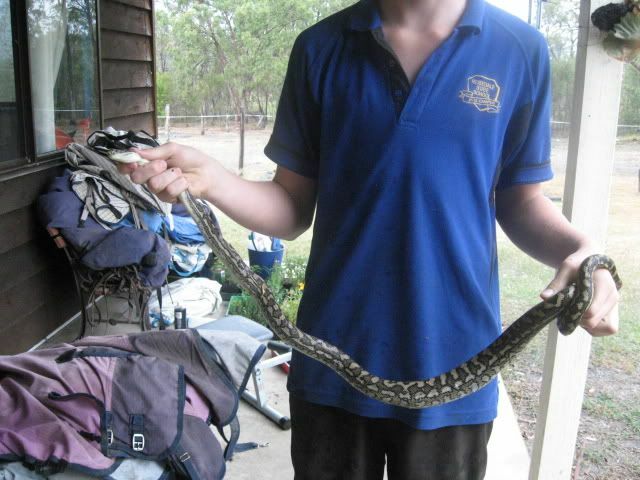 Out of interest, what is the size of a shed snake skin like compared to the live animal? More specifically, do the skins shrink? I saw a snake skin recently which I think we estimated to be about 3.2-3.5 m long. Very approximately, the skin is around 25% longer than the snake it came from. I got attacked by a king brown the other day firepac. Literally attacked, this big fella came at me from 10 metres away and stood up at me and flattened its head like a cobra. It was the most scariest thing i have ever seen. Is this different behaviour than you normally hear about from a king brown? Great thread guys. I spend alot of time working near near oakey creek at bowenville. Without fail, during spring I will see a snake every day. It must be a real hotspot for brown snakes and red belly blacks. On the first warm day in spring this year I saw 6 brown snakes and 1 red belly black sunning themselves on the road, all within about 2km of each other! What was the snake doing when you first saw it? Did it actually strike at you, if so how far away was the snake at the time and how close did it get to biting you? What did you do after you saw it? ( stood still, turned and ran). If its any consolation, the King Brown is not actually a brown snake at all but a member of the Black Snake family, and as such their venom. whilst it would still make you pretty damn crook isn't anywhere near as dangerous as the Eastern Brown. 9 registered (Sandbank, willitrainagain, Anthony Violi, Mcbobbings, Wrasse42, Farra, Homer, mysteriousbrad, ol mate), 63 Guests and 3 Spiders online.